So when using the monitor output to the SC1224 it could be pal or ntsc does not matter correct? The shifter in the ST is driven from the 5v from the PSU. Also the caps around the RF box causes issues, its why I sell recap kits for PSU & video. Ok, i was planning on getting a PSU kit from you, I will ask you about the video when the time comes. 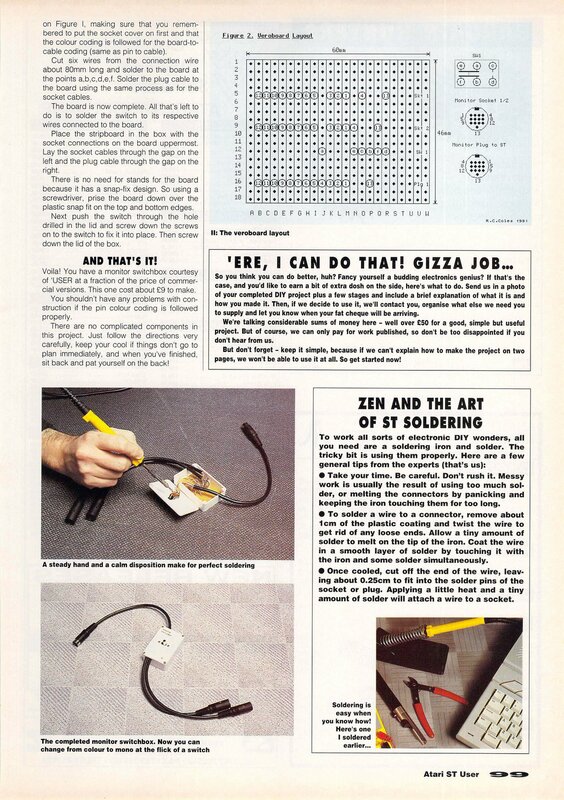 This discussion about lack of modulator - actually, lack of color encoder circuit reminded me about what I seen in my time of servicing old computers, around 1983-95 . Secam was in use in practically whole Eastern block, so in Hungary too. Not in Yugoslavia (PAL) . But I did some TV upgrades in that time - added Secam decoders in some TVs on demand. Commodore 64 was interesting, because it had no extra PAL or NTSC encoder, it was built in it's video chip. Once one C-64 from France arrived. It had RGB output (actually solved with in TV-s used PAL decoder), unlike no other C-64 , Right because same reason why French Atari STs had no PAL encoder. So, that C-64 was usable only with TV or monitor with RGB input if user had Secam TV. When Berlin Wall fell , Eastern block gradually turned to PAL system. What lasted not long - now we enjoy digital TV broadcasting and much cheaper and much better TVs than in those years. And of course. monitors too. What is missing here is mentioning that Atari ST(E) have no real/proper PAL or NTSC interlaced video signal, but progressive one in fact. So, not 25 fps interlaced (PAL), but 50 fps progressive, with half of vertical resthan line count on TV is, in fact . That makes sync. problems on some TVs, monitors, TV cards. Question to the Atari pros in here: Is the Falcon's ST Low and Medium somehow different from the same resolutions on the ST(e)? What I mean is, does the Falcon hooked to a VGA monitor and switched to ST Low not output 15.75kHz? I'm trying to figure out if my ST to VGA cable is the issue here, or if I missed where the Falcon does these differently. I currently have 2 NEC monitors, a 19" I know works with both the Falcon and my STe, and a 17" which works and looks crisp in ST Low, Medium, and High on the Falcon, but only works in a heavily jailbar'd High Res on my STe. I know this cable isn't great, because even on the 19" monitor the picture doesn't look the best on the STe. At least, it looks nowhere near as nice as on my Falcon in the same resolutions. Falcon is more-or-less stock Just a 14MB upgrade. STe has 4MB but no acceleration. Should I try ordering another cable? What do you guys think? It is possible that Falcon works at 60 Hz refresh rate. That is set in NV RAM. You should be able to see it in monitor's Information mode or like. Some people added resistors to RGB lines in cables for ST(R), because analog amplitudes are too high. I don't know about that Falcon perhaps gives more standard (so interlaced) PAL/NTSC signal in composite/RGB mode. French Atari 7800 console is similar. Its videochip MARIA outputs S-video signal (like GTIA in 8bit Atari or VIC in C64), but the French version of console has RGB output. And what is interesting, it use the same DIN 13 like Atari ST, even the pinout and SCART cable is the same. Inside the console is small board with RGB decoder instead of TV modulator. edit: So now I'm more confused than before. I just looked at the 520ST schematics and they clearly show pin 8 connected to 12V (trough a 1.2kOhm resistor) for both non-modulator and modulator revisions. Nice post IngoQ and interesting discussion of the variants out there. Its always good for us to preserve this information for the future. I found looking at the pinout reminded me of an article I submitted in one of the Atari ST User magazines when I was 21 I think (a long time ago). 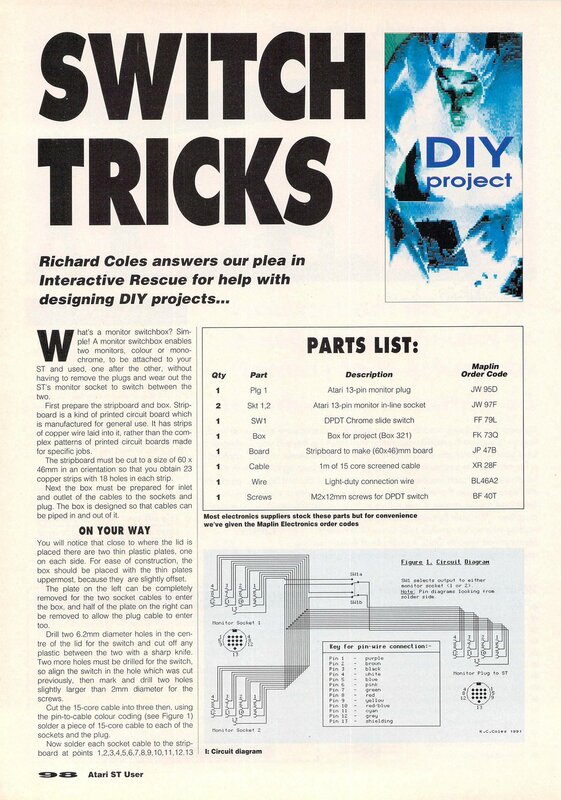 It got me trying to remember how I wrote the article on the ST and on what software, as the magazine wanted the article in a specific format. I think it may of been Neochrome for the images and 1st Word Plus for the writeup. I just checked pin 8 on STE & STM is via 1.2K resistor. Assuming a typo Ingo ?